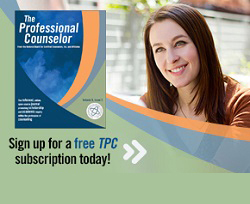 Earn Continuing Education Credit for Reading Articles in The Professional Counselor! The Professional Counselor (TPC) has been approved by NBCC as an Approved Continuing Education Provider (ACEP No. 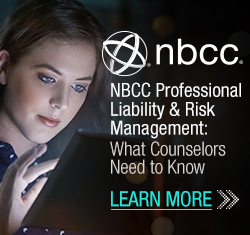 806), and can therefore offer its readers the opportunity to earn NBCC continuing education credit for reading TPC articles. Readers may purchase CE quizzes online for an affordable fee, complete and submit the quizzes, and print certificates for earned credit immediately. TPC is solely responsible for all aspects of this program. 1) Read any article from TPC. 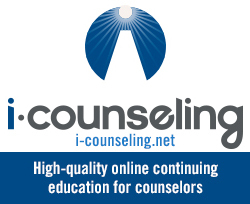 2) Go to i-counseling.net to log in (or register if you are a first-time user). 3) When you’ve signed in, click on The Professional Counselor. 4) Purchase the article’s examination and answer the corresponding questions. Save or print the certificate of completion documenting your CE credit.